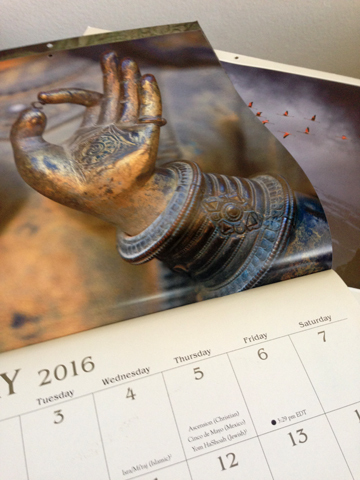 opening the wrapper on a new meditation calendar for 2016, i caught myself. there i was, hanging those new dreams on my wall, while hoping that jax would make it through to the end of next year, next christmas will i still be blessed with him in my life? then, flashing oh-so-quickly on, well, what if he’s not a healthy jax? what if he can’t really walk or enjoy life? what if he is only staying because he thinks I need him to? what kind of a life would that be? certainly nothing i’d wish upon someone i love unconditionally. may each of us sentient beings fulfill our purpose in 2016.
may we live as well as we can, as we desire, as our divine uses us. may we grow in manner same. may we perish peacefully if that is what is meant, or what is needed, what is correct. may i surrender to the learnings and teachings coming my way. may i revel in life. may Life revel in me. sending each and every single being LOVE.